Imagine an exclusive peephole into real-life moments of the past, documented and shared by people from all around the world. And imagine tapping into that wealth of visual gems, and discovering compelling memories of other Photomyners in an Instagram-like visual feed. This, in a nutshell, is what Photomyne’s Discover feed is all about. Want a taste? Check out the Discover feed on the Photomyne website. Access the new Discover feed via the Discover tab at the bottom navigation bar (second from the right). 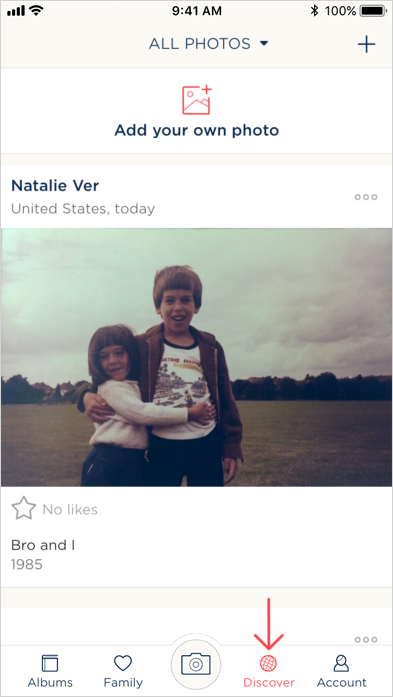 Think of Discover as an Instagram-like feed of photos from history, made up of recently digitized photos of Photomyne users’ past. New shared photos are added to the Discover feed all the time. So this is essentially a constantly-updated feed of real-life vintage photo memories other Photomyners have shared. Love a photo you see in the feed? Like it by double-tapping it. Once you start giving out more Likes, the Discover feed will learn your taste and will start showing you more relevant photos, tailored to your interests. 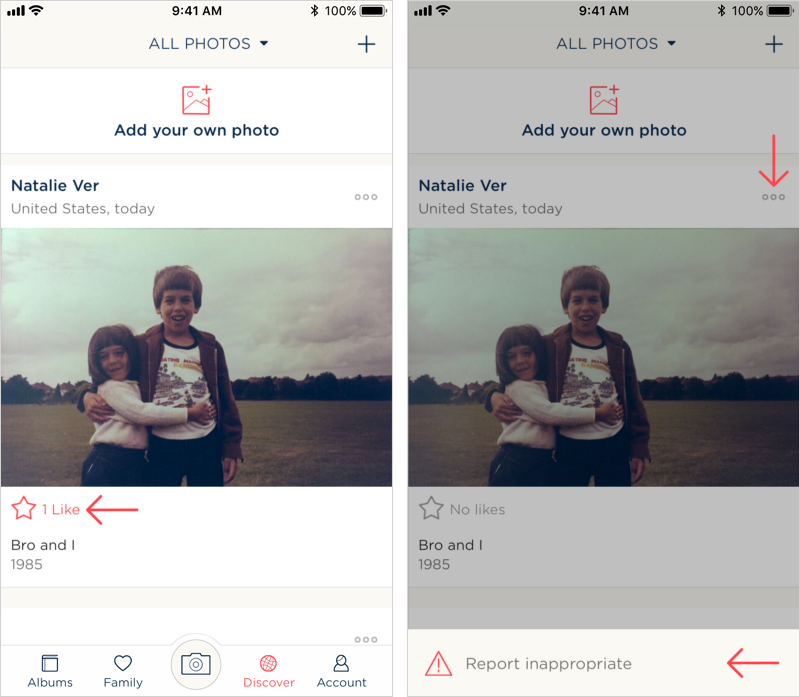 If you come across someone else’s photo you believe isn’t appropriate, you can easily report it by tapping the 3-dot options icon and then ‘Report inappropriate’ in the bottom menu. It will be immediately removed from your feed. Want to publish a photo on the Discover feed? Watch the video on the top of this page to learn how. From within the feed — tap Add your own photo at the top of the feed, then choose the photo, fill in the details and tap Publish. While browsing photos in your albums — if you stumble upon a photo you’d like to publish, tap on the Globe icon on the top-right corner of your screen. Title & year — to give context to the photo for others to better appreciate it. Location & people in the photo — this is optional but is recommended, to give the viewers of this photos a fuller experience. Your name — so we can give you credit for publishing. Your email — so we can let you know when someone likes your photo. (your email will not be published or be visible to others). 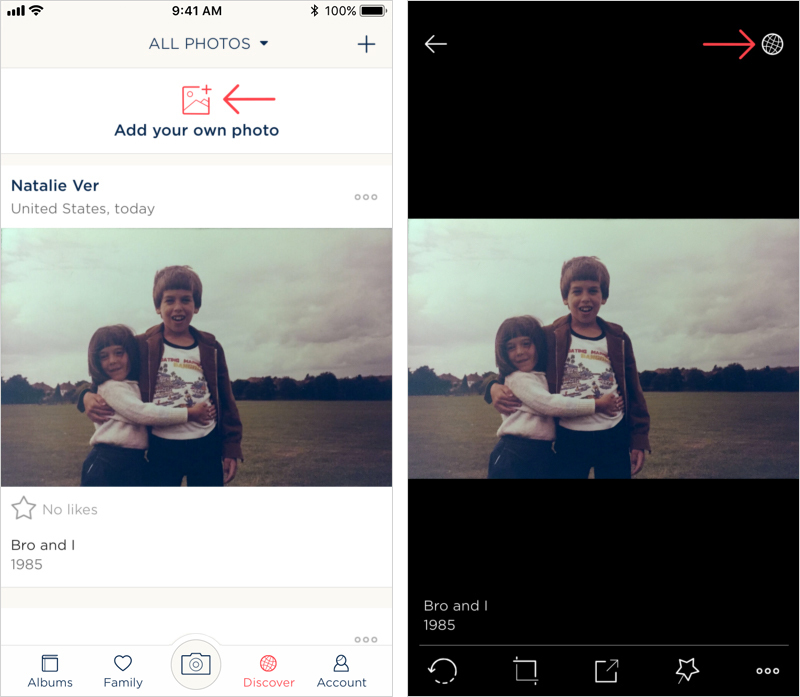 Before sending off your photo to the Discover feed you will be required to add some details. 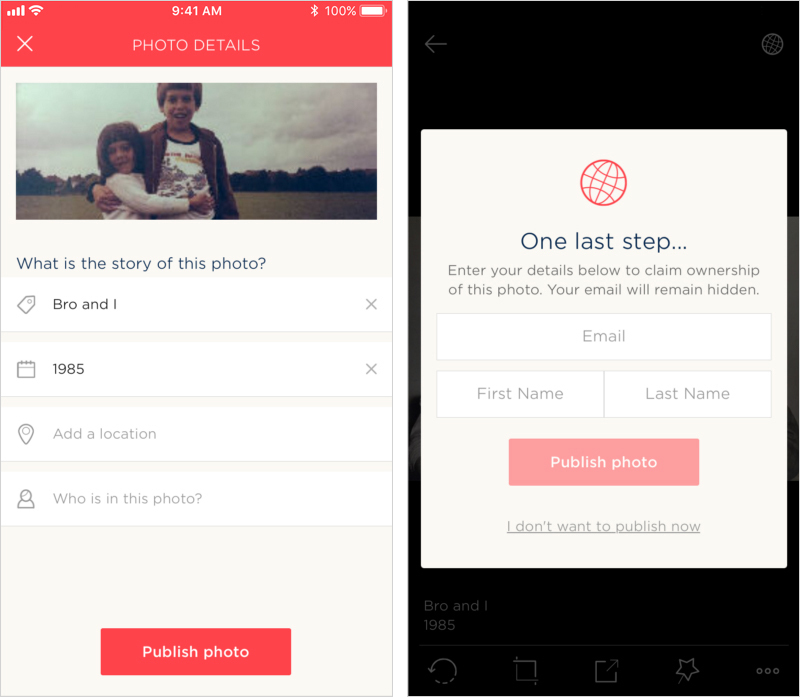 Who will have access to photos you publish to the Discover feed? By posting photos to the Discover feed on the Photomyne app, you're essentially making it 'public.' This means other Photomyne users who browse the Discover feed will see it. 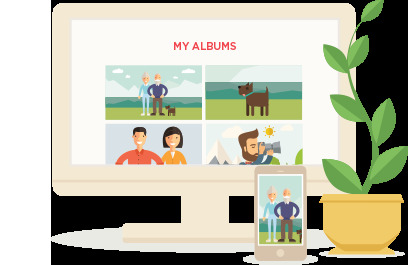 In addition, potential future Photomyne users might see a Discover photo you published, as part of Photomyne's marketing operations and app promotions in various channels. How to unpublish a Discover photo (make it private again)? If you’d like to unpublish one or more of your Discover photos and make them private again, simply open the 3-dot menu of a photo and tap Unpublish photo (make private). Another options is by tapping the Globe icon again when viewing those photos in the app. Explore the best Discover photos online! Each week we’ll showcase the most liked Discover photos in the app online, on our website. Check out these beautiful rediscovered memories right here.